The pnuematic ejector is a extremely simple yet reliable mechanism. Fundamentally, it consists of a receiver or “pot’ that allows liquids and solids to enter without restriction. When the pot becomes filled, compressed air is introduced to displace the contents up to a higher discharge line. The Pneumatic Ejector is unique as a pumping mechanism because no mechanical parts are involved in the actual pumping of the material… and it has no practical limitations on head. Under normal flow conditions, the equipment is designed to operate with a one minute cycle. The cycle consists of two phases. Filling the pot, and then the discharging of its contents. Operation is fully automatic with a choice of electric or mechanical control systems. The plunger type positive displacement pump was first introduced to the municipal wastewater treatment industry by the Ralph B. Carter Company in the early 1930’s. From that time to now, the plunger pump has been a mainstay of wastewater treatment plant design. 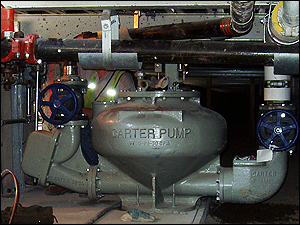 The significant reason for this durability of application has been the success of this pump design in handling both the difficult to pump sludge streams with in the treatment process, and in a pump design which allows for the often erratic service and maintenance procedures practiced at many municipal plants. Although no piece of equipment can function without service or significantly beyond design parameters, the plunger pump’s simple and basically rugged design will, in most cases, “forgive” poor maintenance and periodic excess pressure and load conditions without failure. The dividend of proper maintenance and application has been extremely long service life, in some cases, as long as 45 years of continuous operation. The Carter diaphragm pump is a proven design with over 60 years of reliable service in the market place. Furnished throughout the years with a variety of drives, including diesel and gasoline engines, gears and chain drives. Today the Carter diaphragm pump is driven by an inverted duty motor coupled directly by a metal flexible coupling to the pump main shaft. Ideal for services requiring the transfer, metering and pumping of heavy slurries containing grit and sludge. Simple replacement of the diaphragm only requires the loosening of three bolts and three screws taking approximately 30 minutes. In comparison other pumps require numerous man-hours, regardless of whether they are of double-disc, progressive cavity or hose pump design. Since 1976 we have been a market leading representative for several leading manufacturers in the municipal water and wastewater marketplaces. Our territorial coverage includes Southern California and Southern Nevada. We maintain a Class A engineering contractors and C10 electrical licenses to assist contractors where needed.